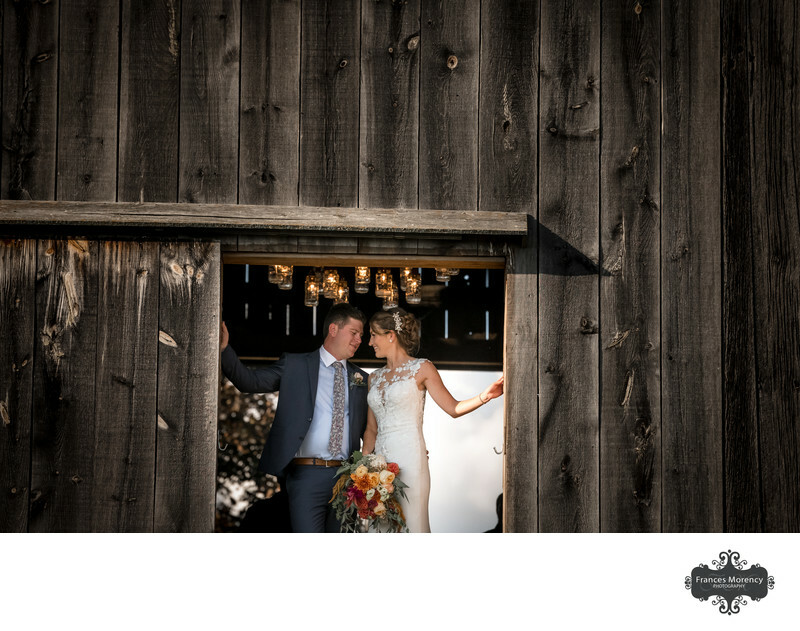 This Caledon wedding had a lot of surprises from the horses to the decor. A unique location for a wedding in a corn field with a barn for the ceremony and a pond for portraits. 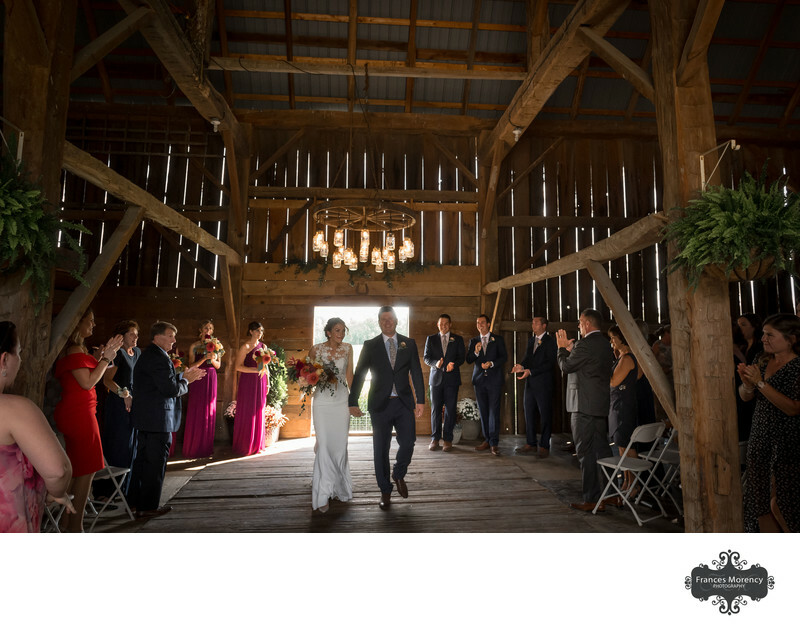 The guests arrived to chivary chairs in a spacious barn adorned with a chandelier and a view of the sky. 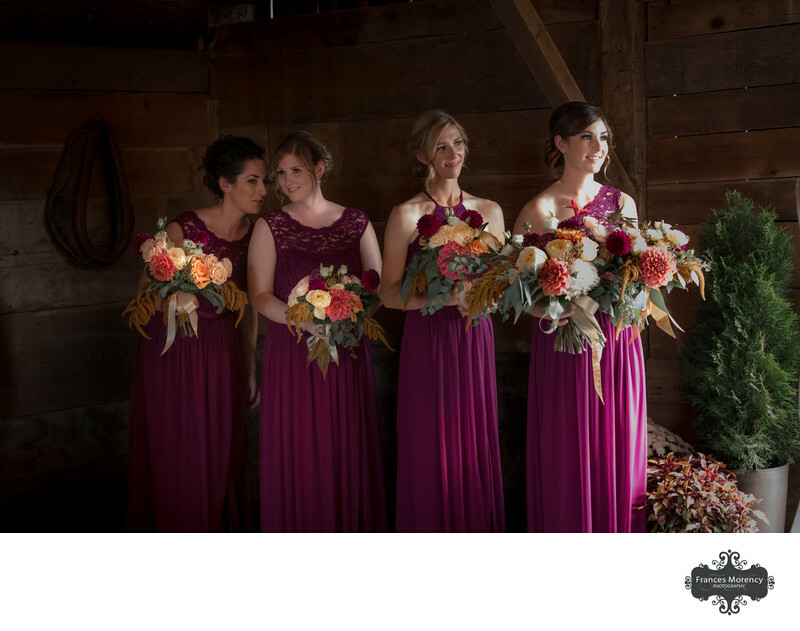 The girls looked gorgeous in beautiful floor length fuscia dresses and flowers from Season's Floral Studio . This barn had an opening overlooking the back fields and the huge tent erected in the corn fields. It also provide the best natural light for the wedding ceremony. 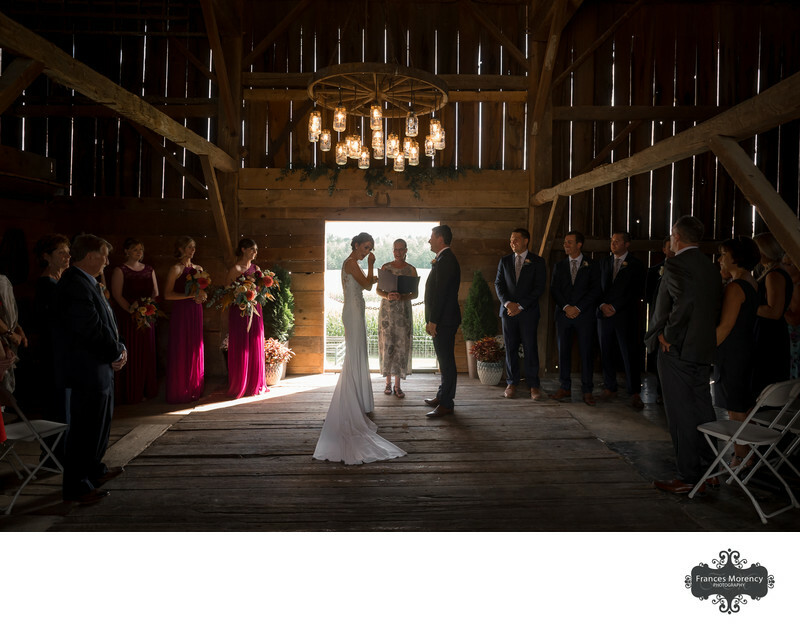 The barn ceremony was touching, emotional and intimate and photographed completely with available light. I used my 24-70mm lens to capture the over all feel of the ceremony just wide enough to photograph some guests and the entire wedding party. I also used my 70-200mm lens to get intimate photos of the bride and groom with all the special moments they were having during the ceremony. A sweet kiss and it was time to party. The bridal party and family headed to the pond area for portraits while the guests mingled at cocktail hour. I'm the wedding photographer who is going to efficiently capture every part of the day and that includes the processional where you are walking in with your father and kissing thank you as he gives you away to your groom. 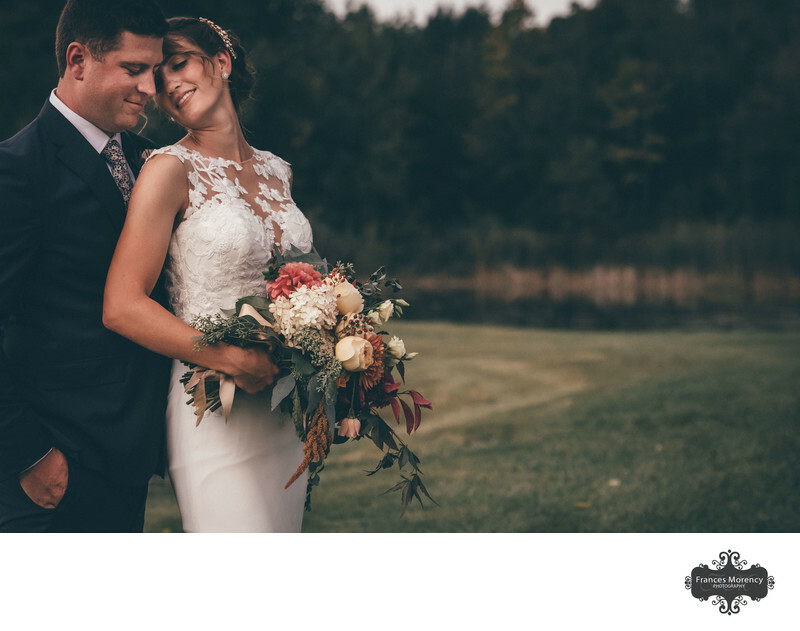 I'm going to photograph all the moments, reactions and movements of your ceremony and the reactions of your guests. Then I'm going to do my best to photograph the recessional with the bridal party as couples walking back down the aisle. I will capture the congratulations after you step outside and the moment you walk away as husband and wife. Choose a documentary or journalistic style photographer who is experienced in capturing every moment, but more importantly is able to anticipate what is going to happen next and photograph it. For me it's NOT the first kiss ..... it's the reaction before and after. It's the reaction when you're walking down the aisle and the look on your grooms face when your hugging your dad. It's the look on your mom's face when all this is happening and it's the laughter during your ceremony when your officiant makes you laugh. The pond was an ideal location away from the guests and ceremony space for bridal party photos and family formals. After photographing the family portraits and the fun bridal party the couple asked me if they could shorten their portrait time so they could enjoy the cocktail hour with their friends. We compromised on 20 min. and a few minutes again during the reception so that they could go party with their guests. When I've got only a few minutes for portraits it's important for me to photograph my couples in motion to get the most natural, real emotions. I make sure I capture one camera aware portraits incase I don't get them alone for the rest of the night and then I direct them in simple movements and photograph them journalistically. I asked them to walk back to the tent with me and take portraits on the way. This way, I got more than 20 minutes and they had to walk back anyways. This was a lot easier to do because we had already worked together during an engagement session. Because they knew how to be in front of the camera we were able to pull off a twenty minute portrait session. Couldn't resist taking a portrait of my couple in the barn where they got married. Keywords: barn (24), Caledon (45), corn (3), fuscia dresses (3), Golden hour (63), pond (9), tented (18). 1/5000; f/5.6; ISO 3200; 24.0 mm.